There would be a great disservice to any form of media that does not recognize the leadership, airmanship, and plain human kindness that Ken Brock brought not only to the gyroplane community but also to aviation in general. It is in very humble remembrance that www.gyroplanepassion.com recognizes a force within a force in the life of Ken Brock. A builder, airshow performer, President of the Popular Rotorcraft Association, and Founder of Ken Brock Manufacturing. We cannot think of a more noble figure to recognize for their contribution to the advancement, safety, and public education for the sport gyroplane and its place in aviation. From an author’s point of view, writing on such a public and well-known figure as Ken Brock would seem a very easy task to put down on paper or screen but the fact is this endeavor was one of the most difficult subjects on which to write. While thousands, perhaps hundreds of thousands have seen, known or heard of Ken few (myself included) have pictures, video, or papers on the thoughts, words or commentary on Mr. Brock. Ken was a very quite person when away from the airport and it is a shame that a person with such a profound impact in a field would almost slip past aviation history without a whisper. Mr. Brock was not nearly as flamboyant as Ken Wallis, he didn’t really seek media spotlight except as needed, Ken was a grassroots person who cared more for the individual than to do interviews about himself. With this understanding, it was extremely difficult to get some of the factual data that I was seeking and data that was unable to be confirmed and therefore had to be refrained from publishing. Ken would however; speak about his sport and passion for gyroplanes at the drop of a flying scarf. What is presented here is the work of well over nine months of research. It is hoped that this tribute to a great airshow performer will keep his lifes passion alive. I first seen and talked to Ken Brock around 1982 at the Annual EAA Convention at Oshkosh. Any who got to see his airshow performance would remain in a trance as Brock would work his aerial magic in a Brock KB gyroplane. I had some simple questions as an inquisitive teenager and he seemed more than happy to answer them for me. I never really had much of an interest at the time in gyroplanes but without question this was my first introduction to the gyroplane. My interests at the time were in airplanes and helicopters but this mid-life gentleman really got my attention with his airshow routine. I would see this show many times over the years and every time all I could do was watch and never once in over a dozen or more shows did I ever stop to think to take a picture, the pictures that remain are only locked in my memory. I suspect that many more were in the same state as I was for the lack of film footage and pictures of Ken’s routine. Ken was born in 1932, a time in American history when people wanted to move on from the horrors of World War I and the gaiety of the Twenties. Americans seemed to be hedging toward more technology, electricity and new innovations but the Great Depression would leave a scar on over a generation on how to conduct business and how to treat their fellow kindred. Ken didn’t leave us much on his early childhood or even where his interest in gyroplanes began but I would have to imagine that at some point in his childhood there had been an ember starting to burn, to fly like the condors over the California desert. To be free in the open breeze and just...fly. The Ken Brock story as it relates to sport gyroplanes begins around 1970 with a Bensen gyrocopter he had built and subsequently modified. 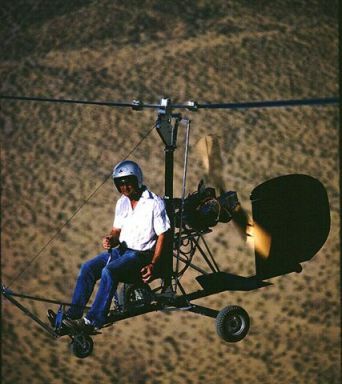 These modifications led directly to a design that Igor Bensen told Brock was a new design and could no longer be considered a Bensen Gyrocopter. The popularity and innovations of Brock’s design lead to the formation of Ken Brock Manufacturing with the intent to market and sell Ken Brock gyroplanes. Brock was one of the first to use the term gyroplane, a term the FAA would later use to define the aircraft type in general. Ken Brock gyroplanes would carry model designations of KB; other models include the KB2 and KB3. The design, as mentioned before, was based off the Bensen Gyro-Copter and from this basic design Ken created an aircraft that would be easier to handle, and fly. While it was not much of a real stabilizer the KB gyroplanes were among the first to add it. Initially installed as a rock guard to protect the propeller on Bensen and other designs. Ken's gyroplanes were among one of the first to start the debate and research of the addition of horizontal stabilzers and would lead to future gyroplane designs incorporating such devices. Brock and Brock Manufacturing would always make safety a top priority with any gyroplane it designed and through the history of the company many changes and modifications would follow the design such as in better rotor designs and manufacturing processes to build them. Brock Manufacturing would later secure subcontract work to build Rutan parts for the Long Eze. Brock always trying to help a friend would offer whatever help he was able to Igor Bensen when the Bensen Company was starting to falter. Alas, the Brock design and others such as the Parsons were finding themselves more popular than the Bensen designs and really there was little to save the Bensen Company in the long term. While the Bensen Company was sliding the Brock was growing. Many thanks to Tom Milton for the use of this video. Not that Igor Bensen did not perform his duties as founder or President of the Popular Rotorcraft Association but the organization did look for a new change and they found that change in Ken Brock. By 1972 Ken Brock would become the second PRA President, taking the place of founder Igor Bensen. Ken would march to a new beat and seek new memberships, safer design aspects to gyroplane design and further the importance of gyroplane flight instruction during his term of President. Brock remained the leading voice as PRA President from 1972 through 1987. This period showed much growth in the PRA as an organization and also in new memberships as Ken would carry the standard for the gyroplane community to airshows around the country and abroad as well. Ken became a well-known airshow performer with his KB gyroplane as the star. Showing the spectators the incredible performance of the gyroplane design. So like his predecessor Brock not only walked the walk as President but also talked the talk by putting on gyroplane demonstrations to help foster more interest in the gyroplane and the KB Gyroplane. Due to weather and aircraft limitations Ken would change up his show as required but what is presented here is the routine most often demonstrated. After getting the rotors spun up, Ken would perform a maximum performance take off. Showing the airshow crowd the short field takeoff capabilities of the gyroplane. Brock would, normally, level the aircraft for a short time to gain some airspeed and then perform a vertical climb to altitude. In many of his routines he might also include some lazy turns as he gained altitude and then demonstrate some high and slow speed passes to demonstrate the handling characteristics and maneuverability of the aircraft. Ken would perform a signature maneuver either following or prior to fly-by demonstrations that would leave the crowd with their mouths left hanging open. The maneuver would start a couple hundred feet above airshow center and then Ken would enter a near vertical decent while kicking in rudder to spin the gyroplane around the vertical. On more occasions than not he would perform this dead stick, that is to say with the engine shut down. Then as the thought enters your mind that this guy may just auger in right in front of us, he would flare the aircraft and land. Being the performer he was, Brock could not simply land the aircraft; he had to make it something special to watch too. With the proper wind conditions, it was common to see Ken hold the nose of the gyroplane up and then have the aircraft taxi backwards a distance before finally bringing the nose down and finishing at show center. Anyone who has had the opportunity to see Ken Brock perform knows just what a special show of airmanship it was to behold. Unfortunately the words here cannot begin to give the awe you felt when watching Ken fly. Brock performed his routine across the airshow circuit in the U.S. and also performed for Sultans and other Heads of State. I can recall my first time watching Ken perform at Oshkosh and not being able to talk. As a roughly 16 year old, I was completely astonished to both the performance of the little aircraft and the complete mastery of the pilot at the controls. Little did I know the impact that it would have on my life in future years but I am grateful that I had the opportunity to see Ken’s gyroplane routine. The late Eighties and into the Nineties was a great period of growth in gyroplane design and development. Many new designs to include the two-place designs of the Air Command and others with enclosed cabins and pods sparked a building interest in many people within the United States. It would be hard to imagine that at least a few of these people were not inspired to take on such a project from the flight demonstrations of Brock. As a new century was approaching, Ken would continue to carry the torch as the gyroplanes greatest ambassador performing his shows and selling his parts and kits at airshows far and wide. Like Bensen before him Ken Brock had a passion for gyroplanes that burned so hot it could ignite a passion in others to realize their dreams of flight in a rotary wing aircraft. A role model of the truest sense, not just as a President of an Association, the head of a company, or a superb pilot, but a fantastic human being. Ken would talk to any and all with an interest in the gyroplane. No matter how trivial or technical Ken always wanted the person to leave satisfied that their question was answered. Ken Brock departed this world October 19, 2001 following an aircraft mishap on landing. Ken owned a small homebuilt airplane and was attempting to land when a tailwheel problem resulted in the aircraft loosing control. It is with deepest sadness that we have seen this man slip the surly bounds of this earth but we were all blessed with his time with us. Ken was approached by well known author for his biography and Ken had thought this somewhat crazy, thinking he was nothing special or that someone would really care about his life and accomplishments. Naturally, the book was never to be but Brock cannot hide in his humility of the great things he did. o. Develops the Ken Brock gyroplane, from which the current name of the autogiro is derived and recognized by the FAA as the official term for all aircraft of this design. o. First elected President of the Popular Rotorcraft Association (PRA). o. Inducted into the EAA Hall of Fame, 2003. Note:In 1971, Ken Brock flew a stock KB-2 coast-to-coast flying from Long Beach, California to Kitty Hawk, North Carolina (3,400 miles) in ten days. Following the accident that claimed Brock’s life in 2001, Brock Manufacturing closed operations after a few short years. So similar, yet different, are the lives of Igor Bensen and Ken Brock that it should only be natural that their lives had intertwined. Both companies were small scale manufacturing operations and neither really had the needed direction, or business focus to carry the company further. Both companies were also at somewhat low points in terms of sales and future prospective sales when the decision to cease operations was made. Both manufacturers had successful aircraft models and sold many kits over the years, some of which are still flying today. The impact on the amateur built market that these two companies had cannot be underestimated. Will the gyroplane industry ever have a stable company like a Boeing, we can only guess. The groundwork for making a successful gyroplane company has been laid and by learning from companies like Brock and Bensen, with new technologies and materials it may just be possible. What should be clear is the need and desire to pass on the passion, not just to others but within the structure of the company itself. Cierva, Pitcairn, Bensen and Brock when will the mold be broken? Brock Manufacturing did do one thing different in it’s operations from the rest, in trying to diversify it’s manufacturing capabilities by supporting other aircraft designs. There in may lay part of the secret to success for other gyroplane manufacturers to branch into additional sectors for monetary security and coupled with a business focus for future designs and improvements. Surely history within these pages shows that history has a way of repeating itself. So who next to carry the flame of passion for the gyroplane? Ken Brock influenced thousands of people to the air and to seek their own small business success, who will be the next to educate, and inform others of the fantastic world of his gyroplanes? Whoever it is they no doubt have some very big shoes to fill and I doubt that that person will have the same respect, humility and debonair as that which was carried by Ken Brock. Ken truly was a one of a kind individual, may his quite legacy never be forgotten. To preserve the accomplishments and memory of a great gyroplane aviator The Ken Brock Freedom Fly-In is held in Ken Brock’s honor. Thanks to T. Chick for the use of the video. Thanks to T. Milton for providing the Brock Instructional video. Thanks to T. Chick for providing the Tribute Video.